Semana Chicana is an annual week-long event organized by MEChA de Yale that addresses Chicano/a issues. This year, we plan to hold Semana Chicana from April 23rd to the 26th. 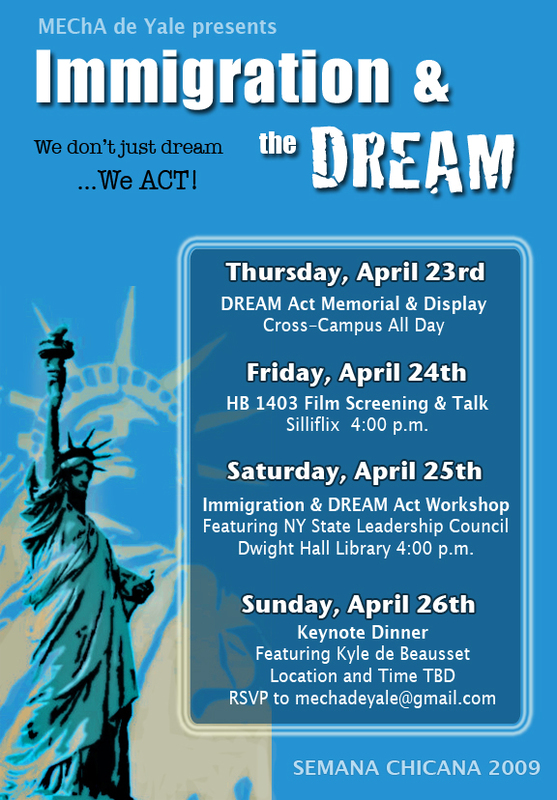 Our theme this year will address contemporary and historical educational disparities in the United States, with a focus on DREAM Act advocacy. As a group, MEChA is founded on principles that recognize education as the avenue for change in our society. As students who recognize the importance of education for social mobility and development, we feel that greater attention needs to be drawn to the inequalities and challenges that currently face the American education system. This event will take place on Cross-Campus and will consist of cardboard tomb stones with short descriptions of talented students who couldn't continue their education because of the challenges and struggles they faced as undocumented students. Tabling will be conducted so that students can sign postcards asking legislators to support the DREAM Act. This will be an all-day event. HB 1403 is a 2006 Award-winning documentary that forces on undocumented students in Texas and the landmark legislation HB 1403, which passed in 2001, that opened educational opportunities to all students in Texas. The film will be screened at 4 p.m. in Silliman College. A round-table discussion/dinner will follow. Marisol Ramos works as a Core Member for the New York State Youth Leadership Council, providing political education and organizing training. This interactive workshop describes what the DREAM Act is and how individuals, particularly students, can become more active in the DREAM Act campaign. Davenport College Common Room, 4 p.m. Closing Dinner with Keynote Speaker, Migrant Right’s Activist Kyle de Beausset. Hoping to publicize the plight of Guatemalans immigrants, De Beausset documented the journey immigrants face from Guatemala into the United States. After his return to the United States, De Beausset, a Harvard Undergraduate, has become a spokesperson for immigrant rights. Dinner time and location TBD.